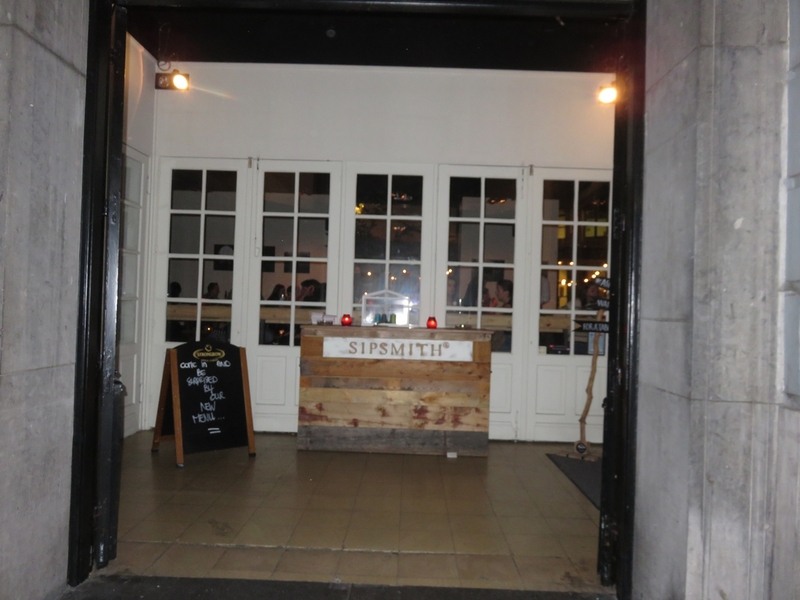 Restaurant review #98 – De Republiek is a brasserie in the city center of Bruges, close to the market square (north west of market). It’s a spacious place, with a larger terrace on an inner court yard. Inside, the tables for dining are on an elevated level. 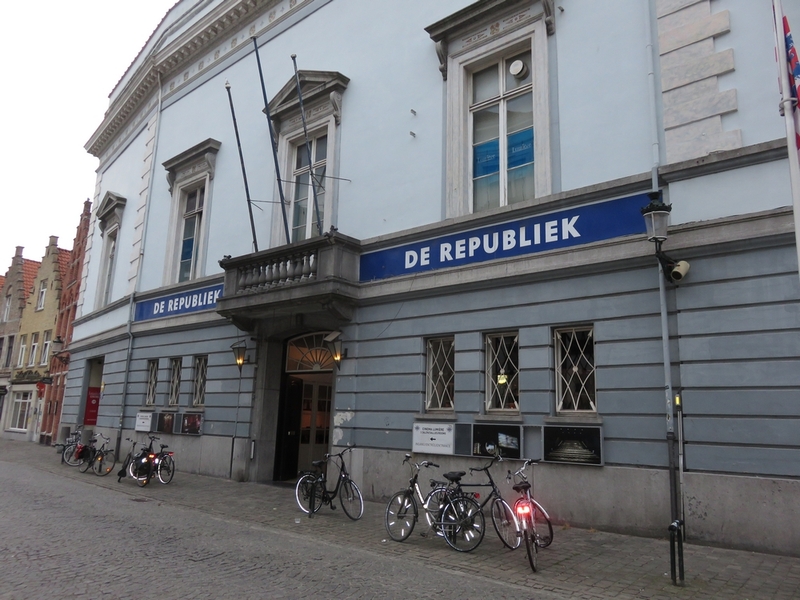 De Republiek is also a cultural hub with rooms for art exhibitions, socio-cultural events and a movie theater. 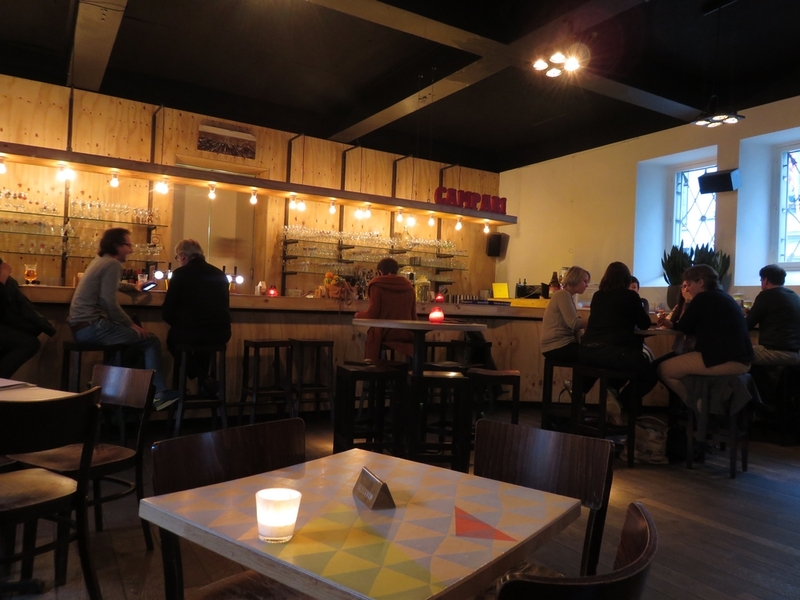 De Republiek has changed owners and I enquired again whether it was possible to get a vegan meal (before I never got a reply). The new owner replied promptly and said there are no vegan dishes standardly available, but there are possiblities to easlily adapt the dishes (preferably ask it in advance when making the reservation). So I telephoned to make a reservation for dinner, and also asked whether we could get a vegan starter or soup, which was said to be no problem. The food was very nice. 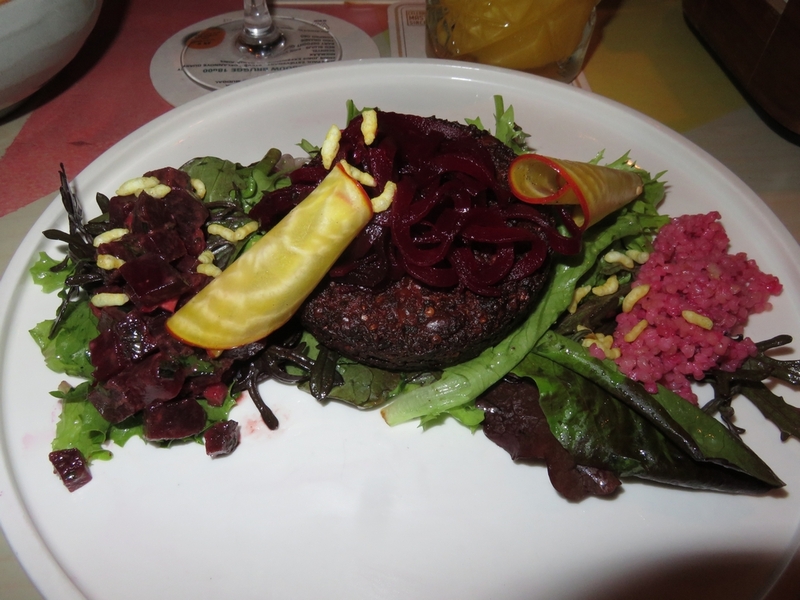 As a starter we were served a dish with a red beet burger. We had a sneeky suspicion it was the quinoa/beet burger from La vie est Belle, as we had eaten it recently at home too 😉 . 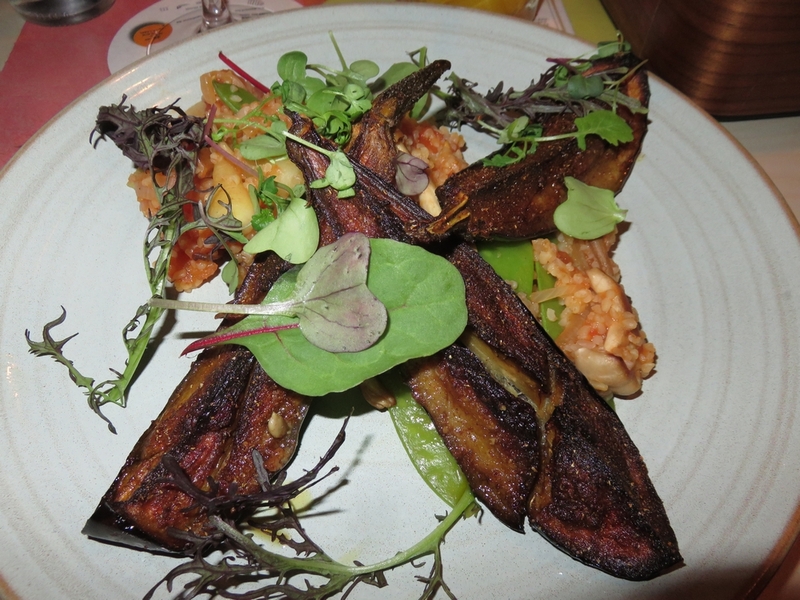 The main dish was grilled eggplant. The dishes were not gastronomically wow, but both dishes were original and varied (and luckily something else than pasta with stir fried vegetables!). Despite having ordered everything vegan, the bread came with butter. An often occuring mistake in restaurants – I suppose those bread bowls are just standardly arranged with butter and as such served. 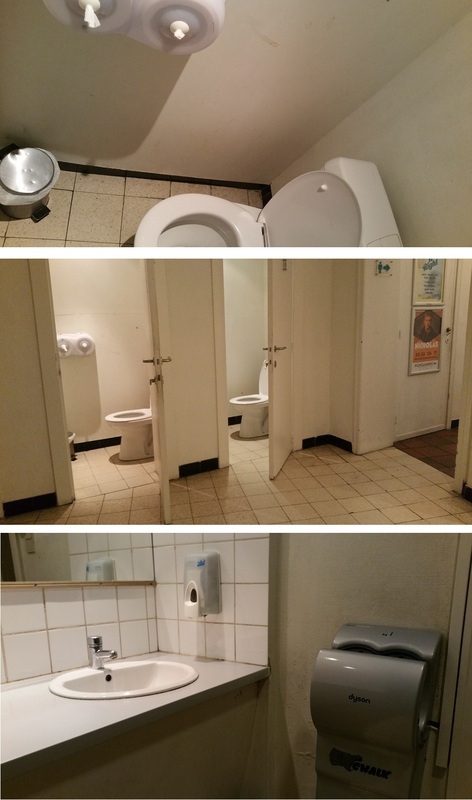 Staff did apologise, which was nice. 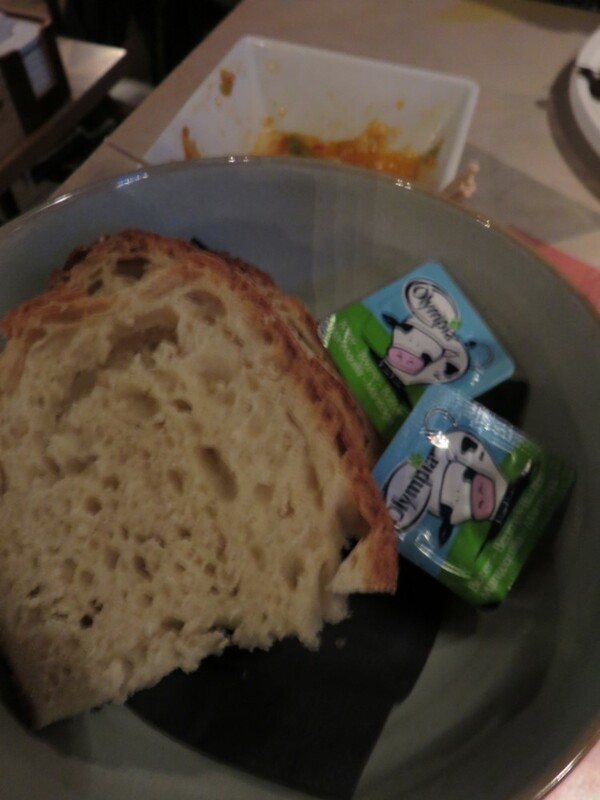 We also declined the bread, didn’t fancy any bread, plus we had no idea whether it was vegan or not (didn’t ask, but I’m guessing they wouldn’t have known, but perhaps you can ask on your visit). 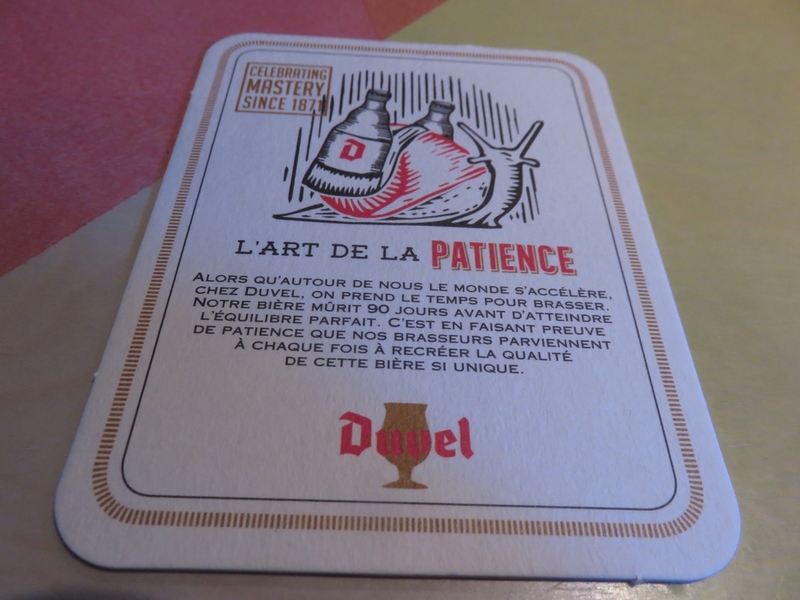 Service was very friendly, but it took quite a while before our main dish arrived (more than half an hour in between). 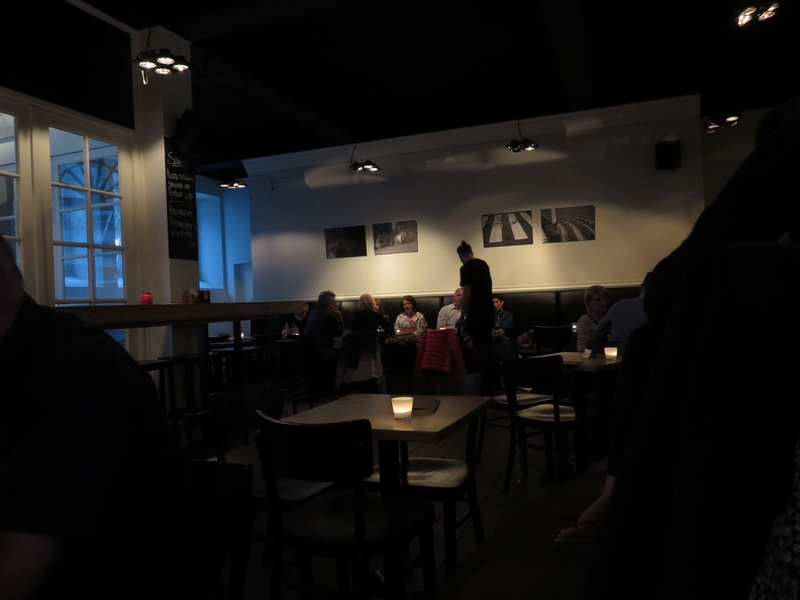 It was very dark inside, but cosy. We were seated on one of the tables on the elevated level. The tables there are pretty close together. Toilets were ok and tidy, but really old-fashioned and school like (with graffitti on the walls).It is not a place for elaborate wining and dining (and in hindsight, we perhaps shouldn’t have asked for a starter, because other people just seemed to go for one main dish), but has more of a pub like atmosphere. I do not remember the exact prices of the dishes, but I do remember being surprised that we paid more for the starter than the main dish. Most dishes on the menu are 15 to 20 euro. (EDIT: meanwhile, have found our bill, prices added to photos). At the time of our visit (end of Summer 2016) there were no vegan cakes available, but it was said that that would soon be the case (vegan pastry from Chez Mariette). 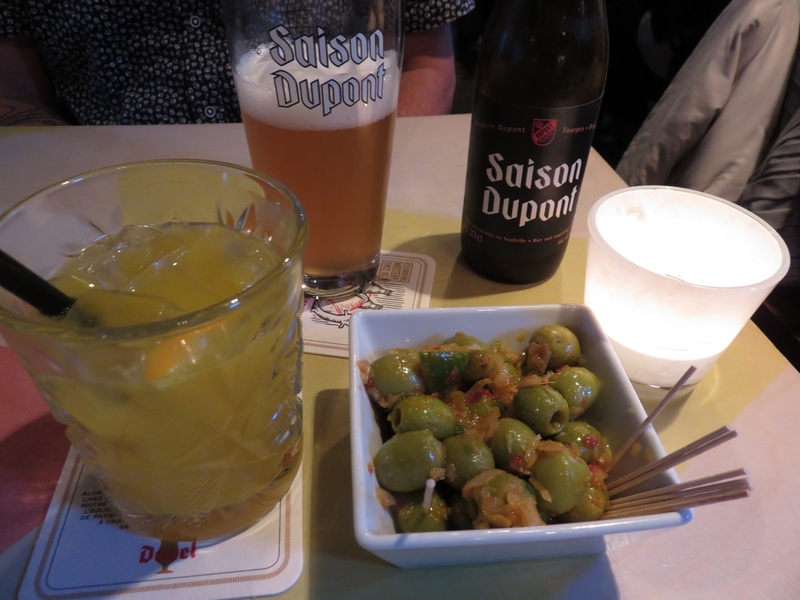 De Republiek is a good place for a casual lunch or dinner. 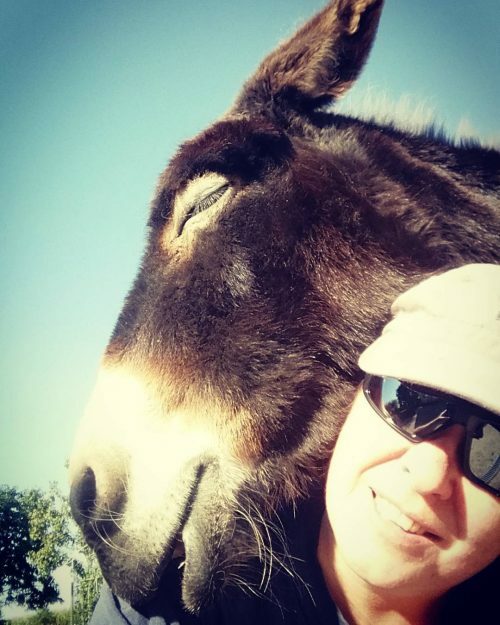 And it is nice to see they are willing to make adjustments for vegans.